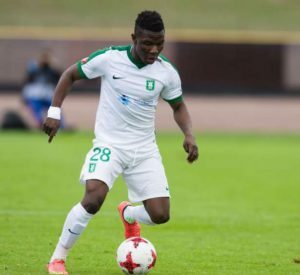 Ghanaian striker Issah Abass netted a brace as NK Olimpija Ljubljana took a giant step in qualifying to the group stages of the UEFA Europa League after beating HJK Helsinki 3-0 at the Stadion Stožice on Thursday evening. The Slovenian giants fetched the opener in the 38th minute through Issah Abass who connected beautifully to Matic Crnic's superb defence splitting pass. NK Olimpija Ljubljana did not add to their lead despite dominating their opponents as the first half was brought to a close. But Rok Kronaveter doubled their advantage on the 50th minute mark via a penalty before Abass sealed the win nine minutes later. Abass lasted 712 minutes while compatriots Anthony Annan and Evans Mensah played 90 and 81 minutes respectively.